Watercolor is a versatile and easily transportable medium. Artists in the nineteenth century used it to paint landscapes en plein aire and to make preliminary sketches before executing an oil painting. In the 20th century, the medium became more popular for completed paintings. Watercolor is applied in delicate, transparent layers that capture the infinite effects of light on color, as seen in the translucency of breaking waves, reflections in a puddle of rain on cobblestones, sunlight on crisp fabric, moldering walls, luminous skin. It can be a difficult medium to work with because it is quick drying, and brushstrokes cannot be reworked, as with oil paint. 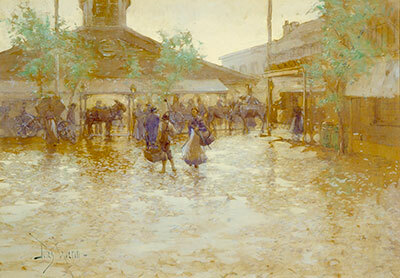 If exposed to light for long periods of time, the thin layers of waterborne pigment will fade, which explains why the paintings featured in Awash with Color: Seldom-Seen Watercolor Paintings by Louisiana Artists, 1789–1989 have only very rarely been exhibited. Approximately 70 paintings by artists both well known, such as Walter Anderson and Alfred Jacob Miller, and more obscure, including Joseph Richards and William Thomas Smedley, were on display. The subjects of the paintings include landscapes, genre scenes, architectural drawings, advertisements, Mardi Gras float designs, and portrait miniatures on ivory. Artists’ sketchbooks, a paint box, and a porcelain watercolor tray help make the creative process more tangible for visitors.